A Hundred years is a short intervention in the life of a civilisation but it’s a big interface in the history of a nation. Exactly 100 years ago, a man appeared in India and disrupted a sleeping giant. His name was M.K. Gandhi and he spread the message of non-violence, truth and satyagraha. A hundred years later, another Indian is engineering disruption of a different kind. His name is Narendra Modi. Gandhi, before embarking for the Indian coast, successfully experimented with truth in South Africa, and could say, with disarming simplicity, “I bear no enmity towards the English”. Similarly, Modi had his own “simple” brush with history in Gujarat. His instruments of truth have been entirely different from Bapu’s. India has taken a distinct turn in the last three years. Whether this turn is civilisational remains to be seen. Modi adheres to an ideology which is at war with history, and with thousands of years of civilisational consciousness. We have collectively witnessed the change in shades of Indianness, the social fabric tearing, the impulse of “us” versus “them” intensifying, the sense of victory over “others” getting crystallised and a consolidation of base instincts like viciousness, bitterness and vengeance. Manmohan Singh left a regime besmirched by corruption. Modi was seen as an alternative who, as chief minister, had created a lethal cocktail of brute state power and ruthless crony capitalism. Once he moved to Delhi, it was assumed that he would be a “new” man who would rid the Indian state of indecisiveness, policy paralysis and multiple power centres. But over the years, his Gujarat experiment is written in bold letters across the country and people have begun saying what a friend of mine told me a few days ago — that, in his lifetime, he probably would not see the India that he lived in till 2014. When Akhlaq was killed by his neighbours in a Dadri village, it was considered an isolated incident. But the brazen justifications by central ministers and their ideological colleagues in the name of cow protection hinted at a new dawn. This was followed by Rohit Vemula’s suicide. The ban on beef in Maharashtra, the appointment of Yogi Adityanath as chief minister, the overnight closure of slaughterhouses in UP, killings or thrashing of the likes of Pehlu Khan in broad daylight and the merciless beating of Dalits in Una, are all reflections of the mindset which looks at minorities as the enemy and the marginalised with contempt. But what surprised me most was the silence of the prime minister. He was also silent when campuses were targeted by the RSS’s student wing, the ABVP. If JNU was targeted for its internationalism and pluralism, Jadavpur University was taken to task for its vibrant leftism, Hyderabad University for standing by a Dalit student, Delhi University for its democratic freedom and the FTII for its creative liberalism. A young scholar, Kanhaiya Kumar, was beaten inside the court, senior SC lawyers were openly heckled and institutions were left rudderless. A “new nationalism” has been invented which is masculine, blind and unidimensional, which entertains no discourse except one on Kashmir, Pakistan, terrorism, Naxalism and national security. This “new normal” harbours a bizarre contradiction — it inflicts surgical strikes on Pakistan and, at the same time, permits the ISI to inspect the Pathankot air base, but it does not give space to any alternate discussion by its citizens. The Kashmir issue has been so badly handled that it reminds us of the pre-1991 situation. The army has always been given an exalted position but it has now acquired a mythical status, which does not auger well for the democratic ethos of the country. 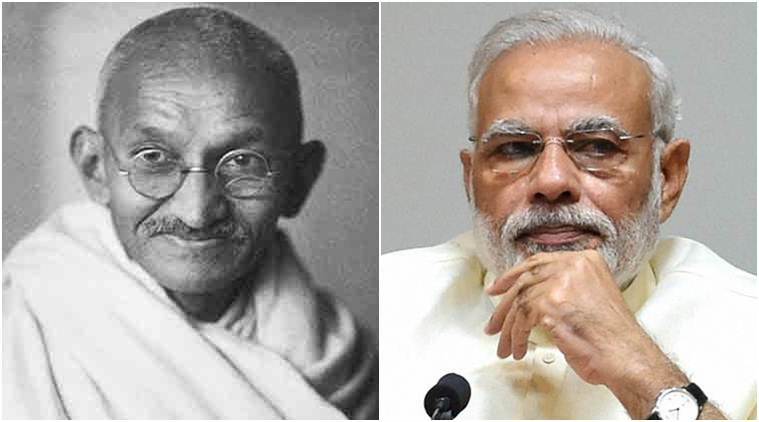 Gandhi espoused compassion, Modi invites intimidation. The naked use of power has diminished the autonomy of institutions; the cabinet system has surrendered to the cult of personality; the bureaucracy is deeply politicised; shadowy figures are omnipresent and every conversation is eavesdropped on; bipartisanship has been thrown in the dustbin, institutions of opposition — political parties or the media — are circumvented; and the whispers in the corridors of power are that even the judiciary is feeling the heat. But he is winning election after election and a new myth has been formed that he is the most popular PM India has ever had. Today, one is reminded of Gandhi and the consensus he built. That consensus is broken. The past three years have shown glimpses of the future. If this disruption is allowed to continue, then no Gandhi will ever say what he said in 1942: “A mission came to me in 1906, namely to spread truth and non-violence among mankind in the place of violence and falsehood in all walks of life.” It is ironic that Modi belongs to the same Gujarat which is the birthplace of Gandhi. Yes, 100 years is too long a time.